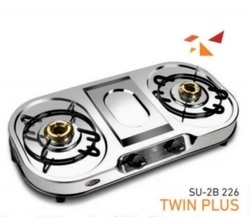 Being one of the reckoned enterprises in the market, we are highly affianced in offering an optimal class gamut of 3 Stove Burner Counter to our patrons. Compact Nano Body L. P. Gas Stove, it's the most economical range L. P. Gas stove in our range of products with same supireior quality of Sahara. Two burner glass top series with toughened, tinted, sparkling glass top these gas stoves enhances the beauty of every kitchen.